This year has held a lot of FIRSTS for me. 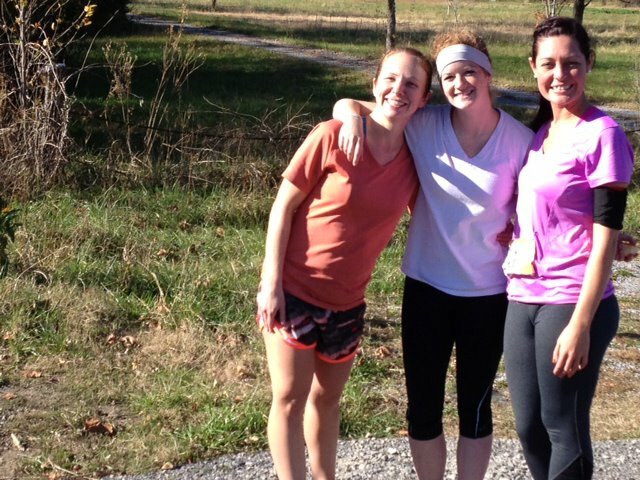 The most memorable ones revolve around running. 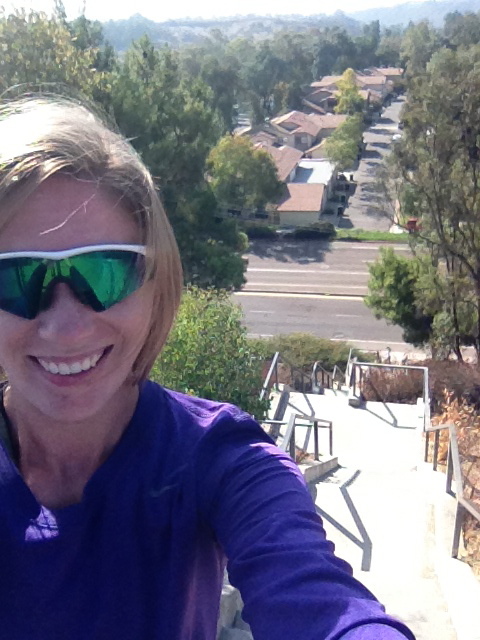 This has been a hard year, running has given me an outlet for channeling personal pain. I know for a fact I’d be completely crazy if not for running. 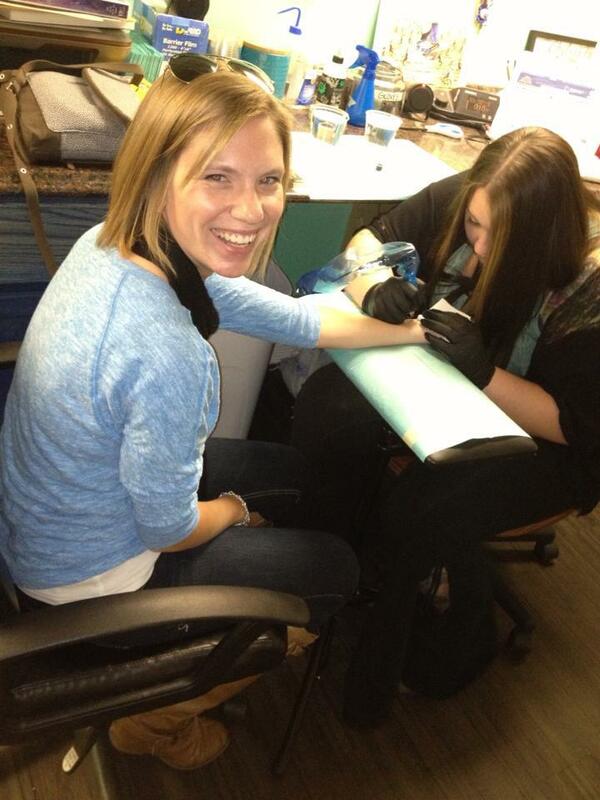 I’ve wanted a tattoo for a while, but not just anything and not just on a whim. It needed to have meaning and importance. 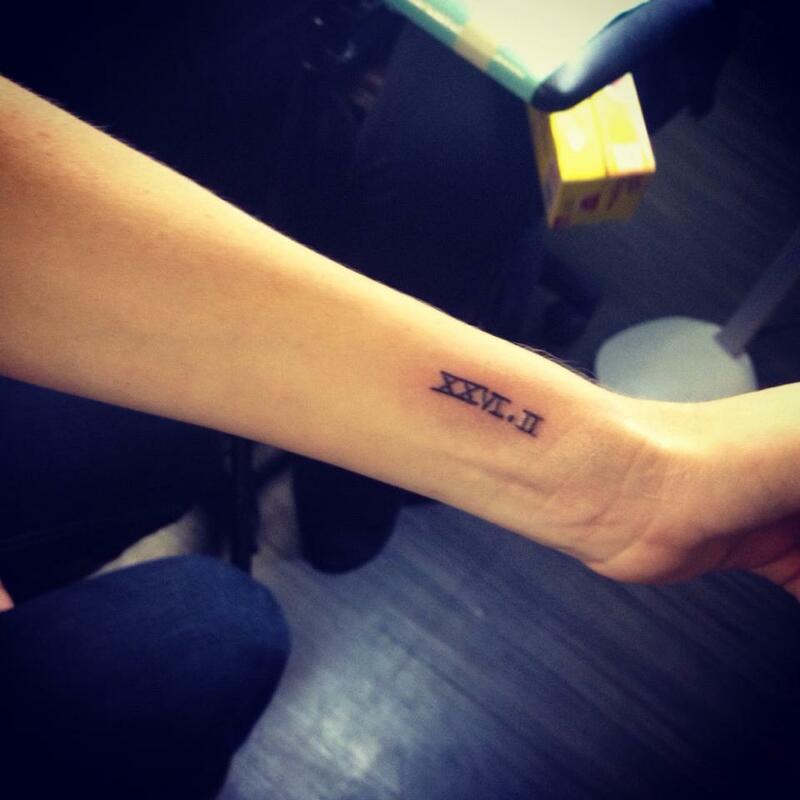 I decided to tattoo 26.2 in roman numerals on my wrist. I ran my first marathon this year while being 26. 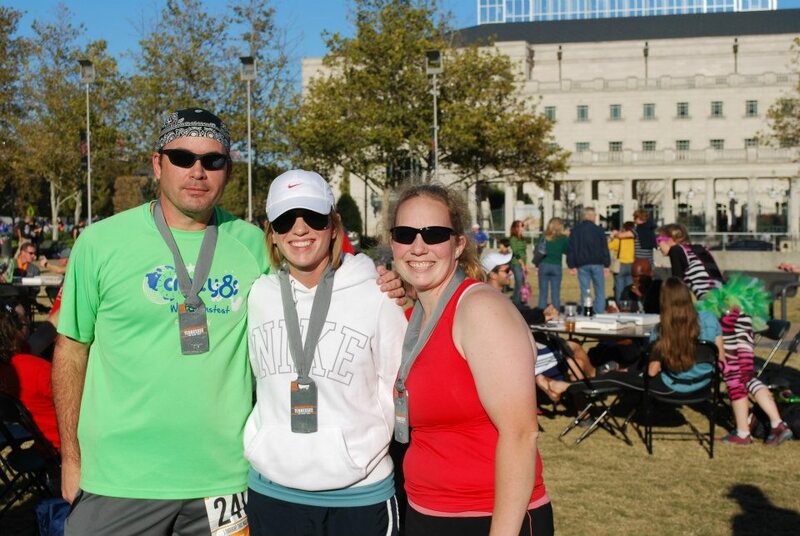 But more than just running 26.2 miles, I’ve endured a lot of personal struggles while being 26. This year has been one of survival and endurance. I just celebrated my 27th birthday and I’m turning a new leaf over. I’m growing up and I’m ready to live my life. So this tattoo not only represents what running has taught me but represents the person I’ve become through running. 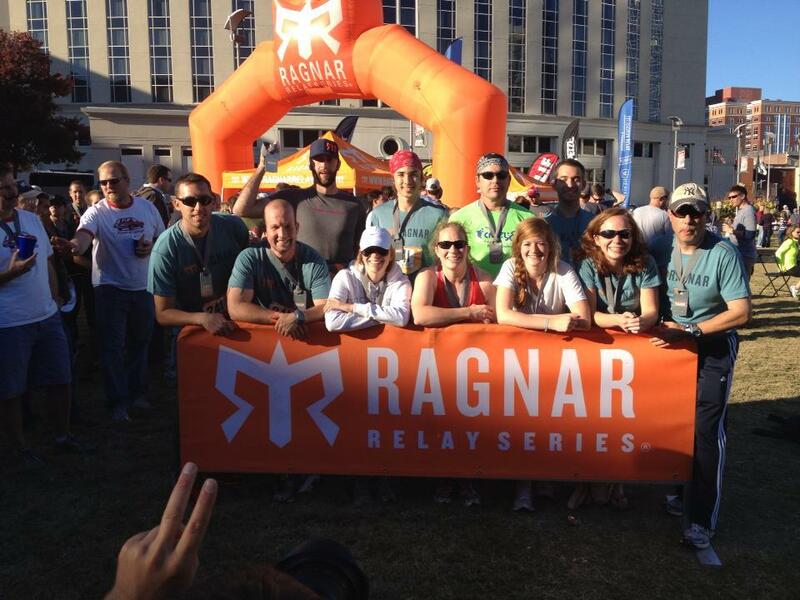 I’ve tried 3 or 4 times now to write (or blog) about my Ragnar experience. I still can’t find all the right words to describe this past weekend, but EPIC is a good one to start with. I can’t really tell you who had the original idea, I don’t remember. 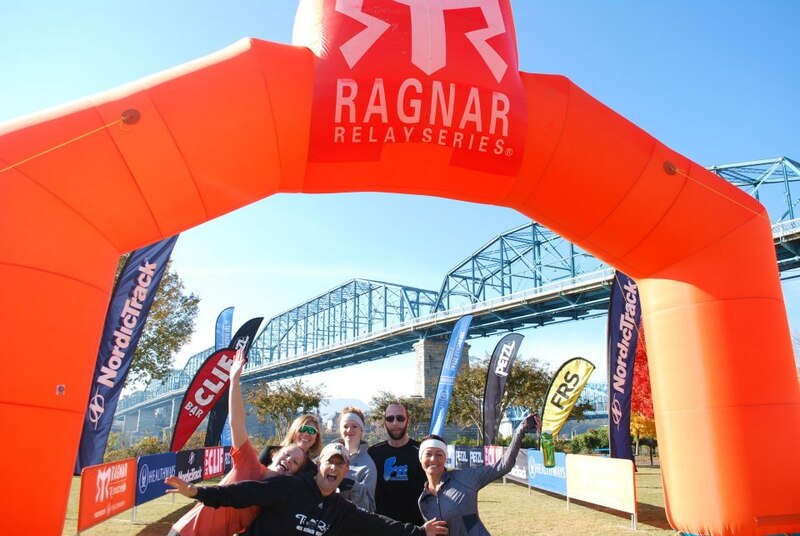 I just remember getting a phone call from Chris (fellow team runner) that he had booked a flight to Tennessee for Ragnar and thus begin this adventure. Along with telling me I had to organize it. I didn’t mind, I was happy to do it. 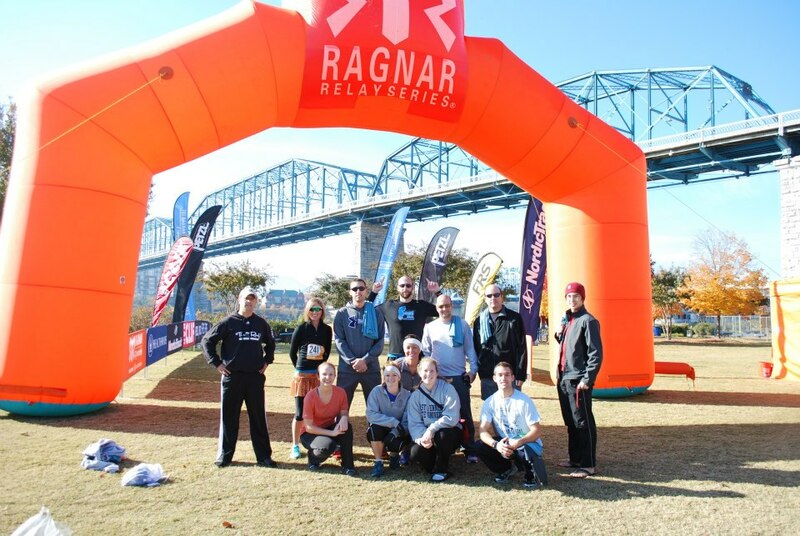 I knew it would be hard trying to find 12 people in Tennessee to run with us, we had 6 total that at least knew someone. The other 6 were complete strangers. Once I registered our team, it didn’t take long at all to fill the runner slots. 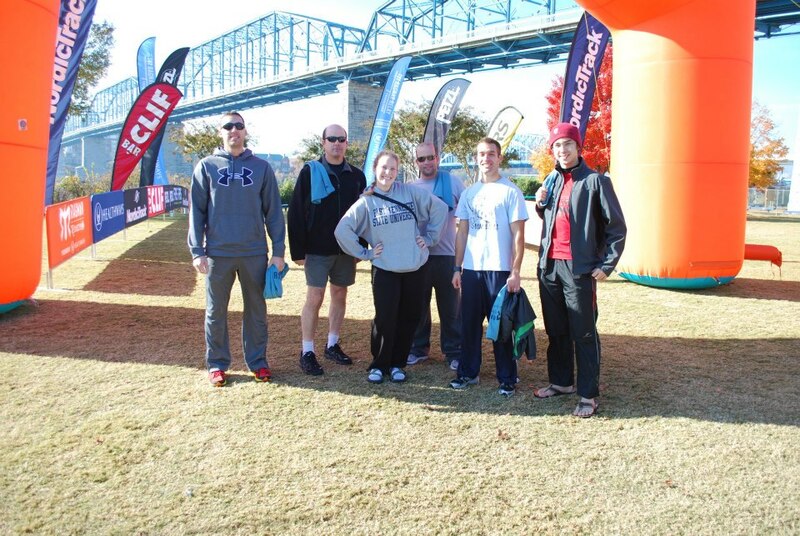 Our very random, but awesome relay team at the start line in Chattanooga. I started off Leg 1 with an 8 miler out of Coollidge Park in Chattanooga. 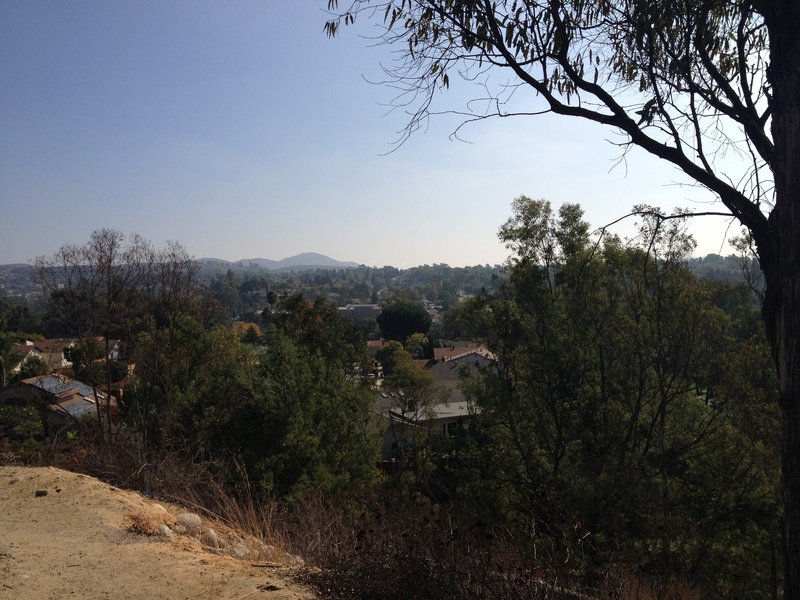 The scenery was gorgeous and I felt like I ran strong but conservative. I had no idea how I would feel as the relay progressed and couldn’t risk wearing my legs out first thing. I stayed with my target pace though, so I was satisfied. This trip wouldn’t have been possible without our two amazing drivers. 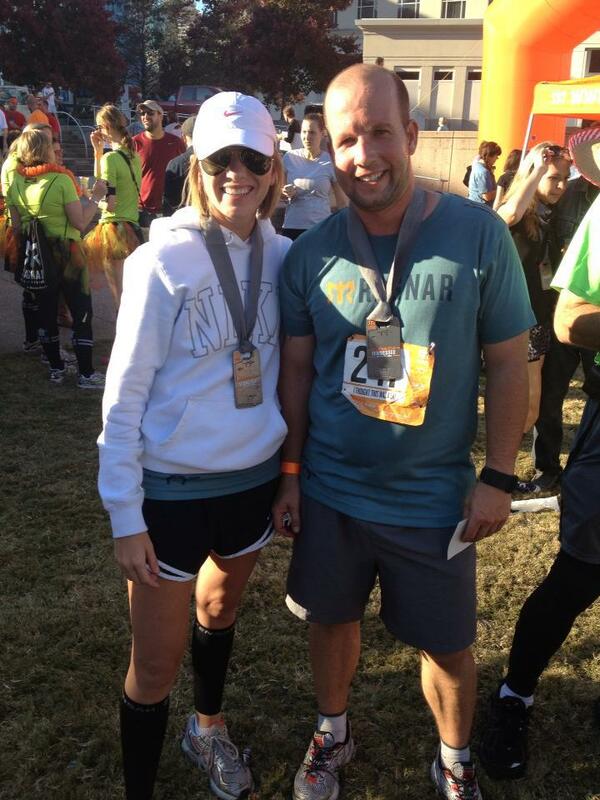 Lindsay Fullen (van 1) and David Daniels (van 2). They navigated us 200 miles with little to no sleep, endured us yelling at them (when they ran red lights or didn’t have their headlights on), and never once complained about how bad we all smelled. 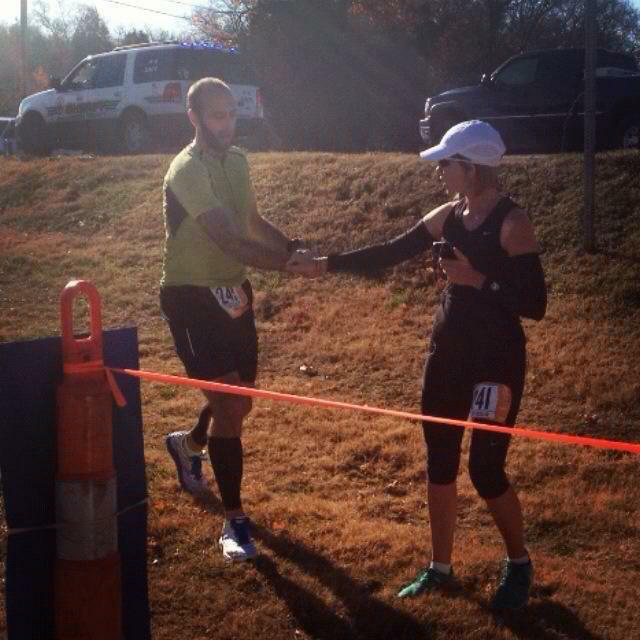 Back to the relay – I passed off to Jenny who started her 1600ft climb out of Chattanooga and rocked it. 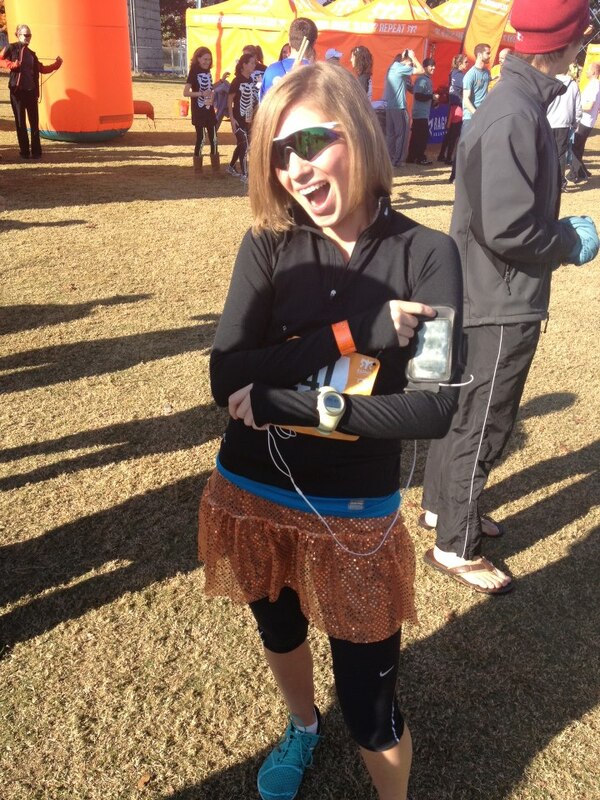 We stopped to cheer her on several times, each time she had a smile on her face and just kept knocking out each mile. Then it was on to Kelly who flew down the other side of said mountain and passed off to Marc. Marc to Michael, then Michael to Jayney (who by the way was running her second ever race). 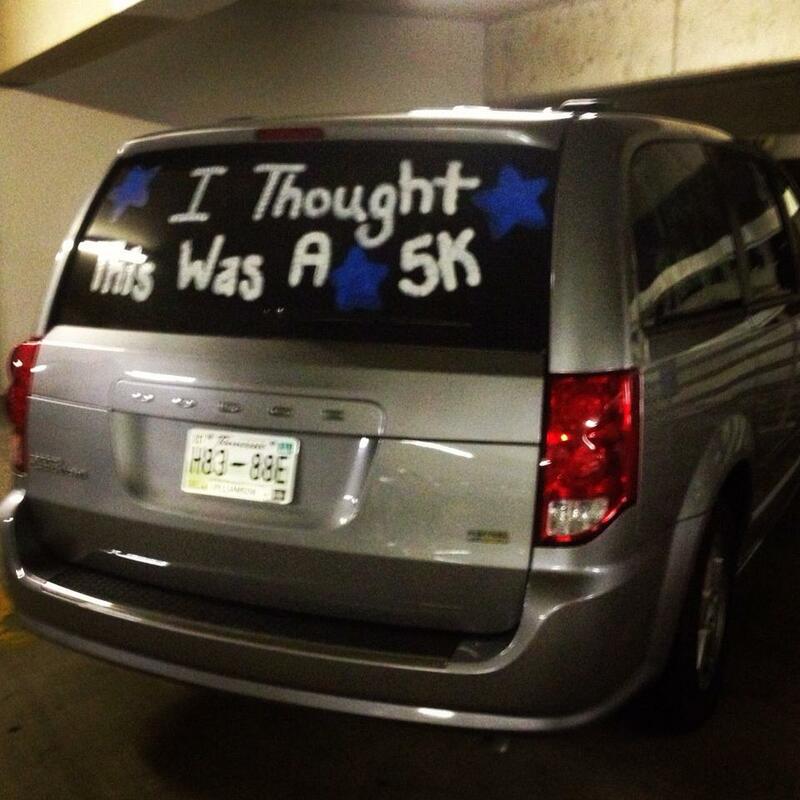 Meanwhile, van 2 was killing time waiting on us to finish. Jayney passed off to runner 7, Chris, who started the second leg of the relay. He had an extremely tough climb as well. I was passed the baton again around 7pm (??) to start my second leg. By this time, it was completely dark and I just wanted this run over with. For some reason, it was my least favorite leg, even though it was the shortest (or what I thought would be the shortest). After passing off to Jenny, I literally ate 3 donuts, 1 bagel, some trail mix/cranberries and downed a bottle of water. Little did I know, I’d be running again very shortly. Jayney started feeling bad, feverish and sore throat. 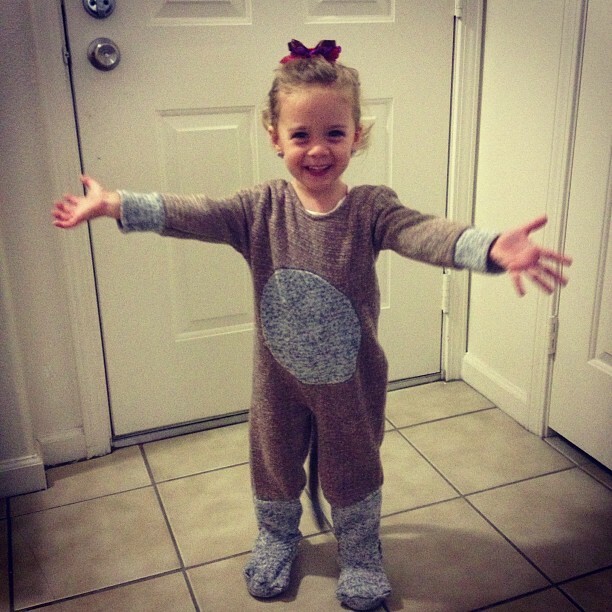 It wasn’t long before I knew, she wouldn’t be able to run her second leg. I don’t remember much, except telling her I would take this one for her and for her to get some sleep. Those donuts were a bad idea. 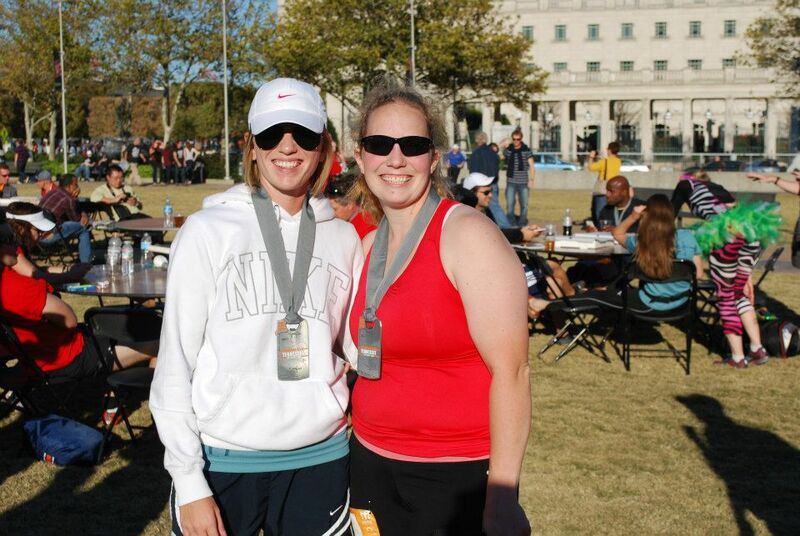 I have to say, I learned more about perseverance from Jayney then any marathon training run could ever teach. She stuck it out with us for the next 15-16 hours so we could finish the race. She was extremely sick, stuck in the back of a van that smelled (I’m sure) terrible, and never ONCE did she complain about it. We would find out later after she was admitted to the hospital, she had strep. She was our MVP for sure. 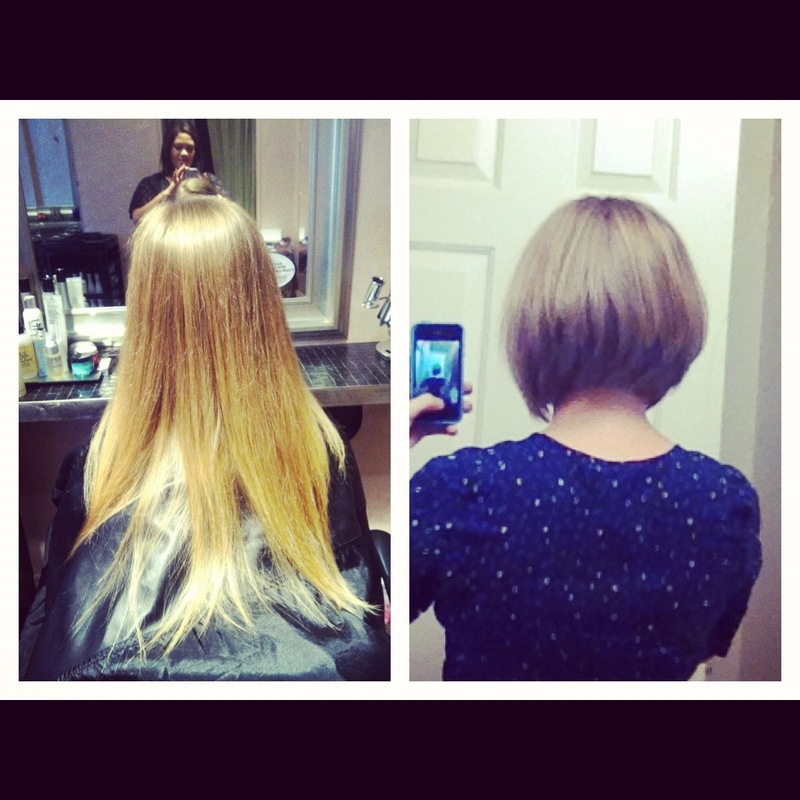 So Jayney, THANK YOU from the bottom of my heart for allowing us to finish. I would end up running her last two legs, it was the least I could do. Last exchange for van 1. Running my (Jayney’s) final leg. 4.5 miles of rolling hills in HOT Franklin, TN. Hearing my teammates cheering was amazing. I love each one of them!! If Chris didn’t have to start his final leg, I would’ve hugged him. 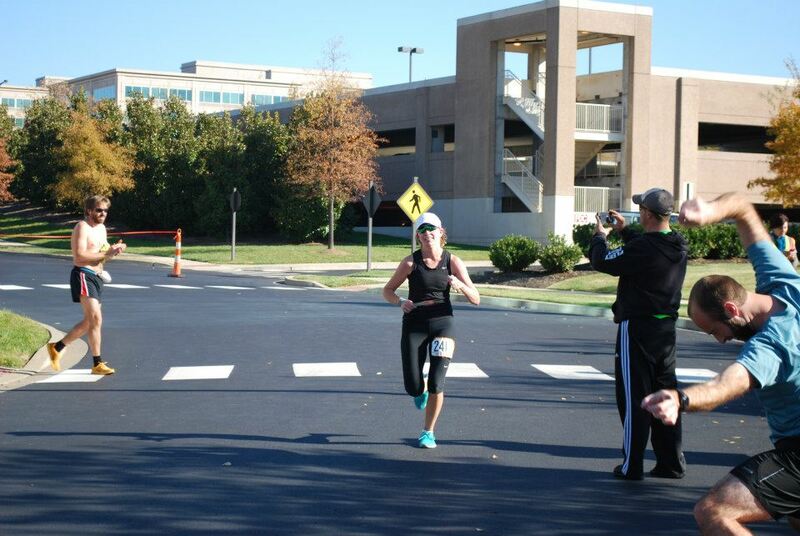 I was so happy to be done running and headed for the finish line in Nashville. 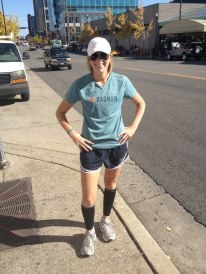 Also another shout out to our awesome teammate Kelly, who allowed sweaty runners in to her home to shower and clean up. That was the most glorious shower. You’re the best! 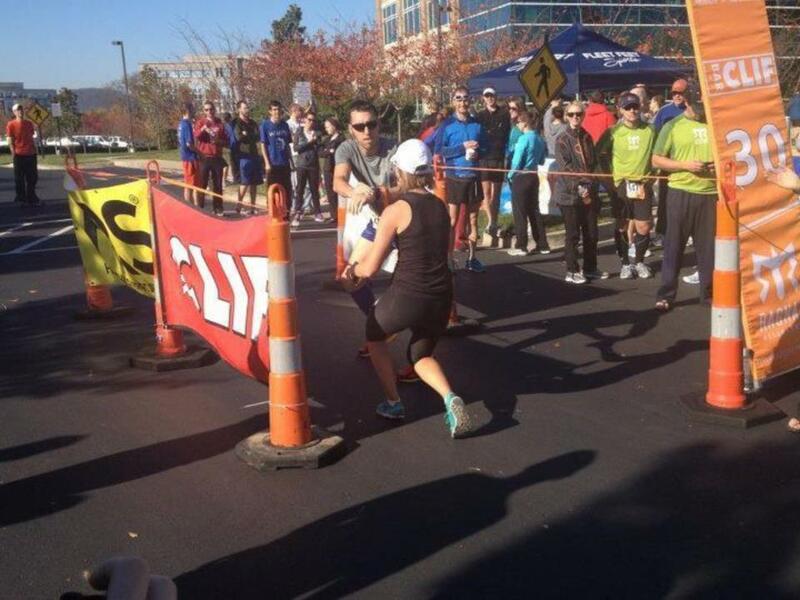 Chris Daniels brought it home for us in Nashville, finishing our 200 mile relay. We set out to accomplish one goal and we came together and did it. 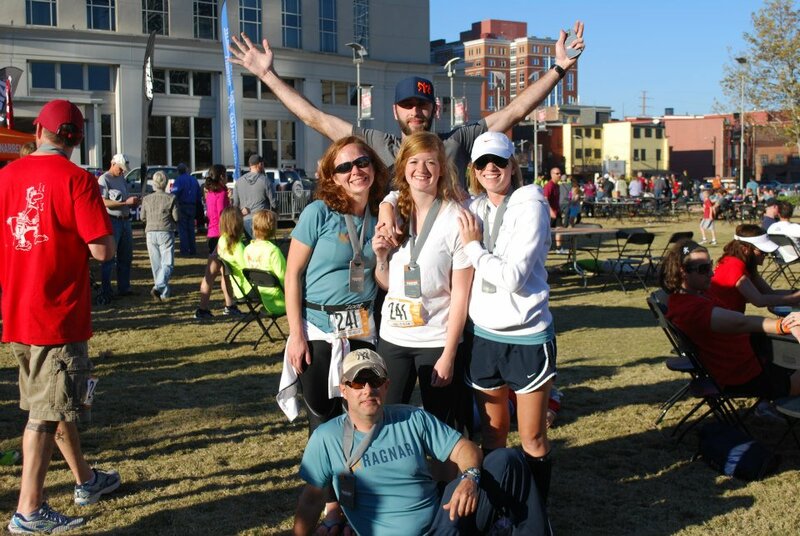 We may not have been the fastest, but we each ran our personal best. The camaraderie between endurance runners is one like no other. All I have to say to that is…’Sho nuff’. Thank you Lindsay, David, Joel, Sarah, Jenny, Kelly, Marc, Michael, Jayney, Chris & Chris, Sho, & Spencer (and their families for sharing them) for an incredible weekend of unforgettable memories. This has been the highlight of my year and quite possibly my life. No other race will ever compare, and I wouldn’t want to share the memories with anybody else. Joel, me, & Sarah – thanks for being crazy enough to say yes! Chris and I. Thanks for suggesting we do this! It’s been a great training week…40+ miles of cardio and tons of strength conditioning. I climbed stairs today. After a 10 mile (hard) bike ride. Rode with a friend at Lake Miramar, which is a 5 mile loop, one way. But it’s quite hilly and curvy. So got to work on some bike handling skills. 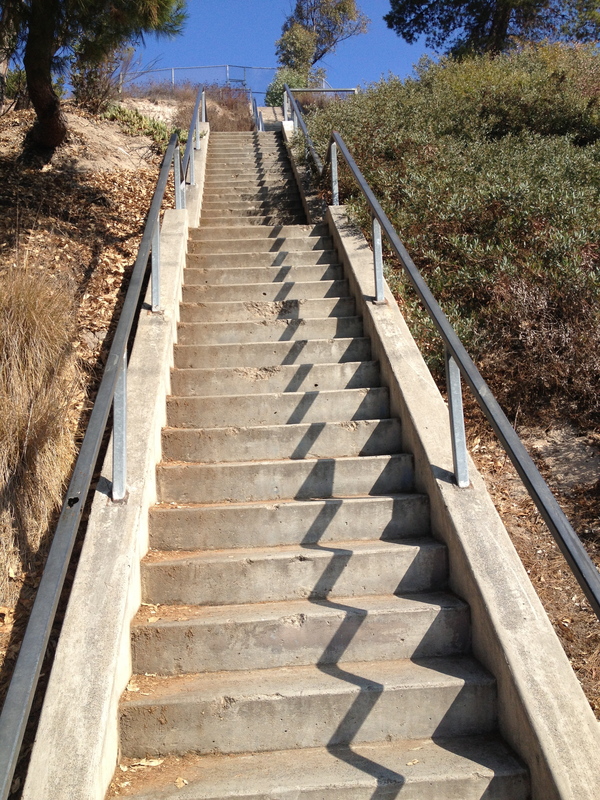 Afterwards, we decided to run the “Stairs of Death”…that’s literally what they are called when you google them. No joke. Tierrasanta Stairs of death. Awesome. Let’s run them! That’s how us endurance athletes roll. Our legs were pretty shaky, so we kept it to 5 sets. I’m so bummed I’m flying out next week, I will definitely add these to my weekly workouts! Not only is it a great aerobic exercise, but also an anaerobic one as well. I don’t think my little heart has ever worked quite so hard! Great for lower body conditioning and power as well. The workouts are endless. 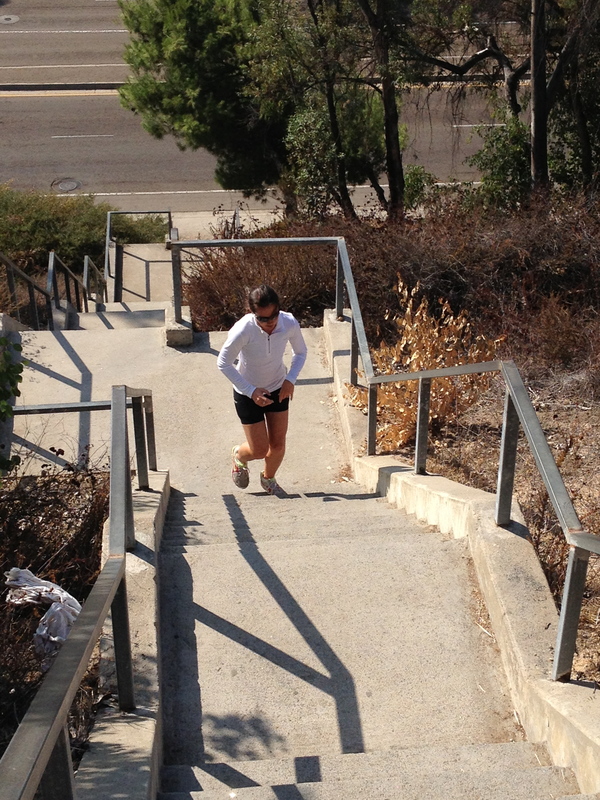 You don’t have to run up and down over and over to get a kickbutt workout. Danielle, who mind you, did 8 sets of them last night. Bless her! 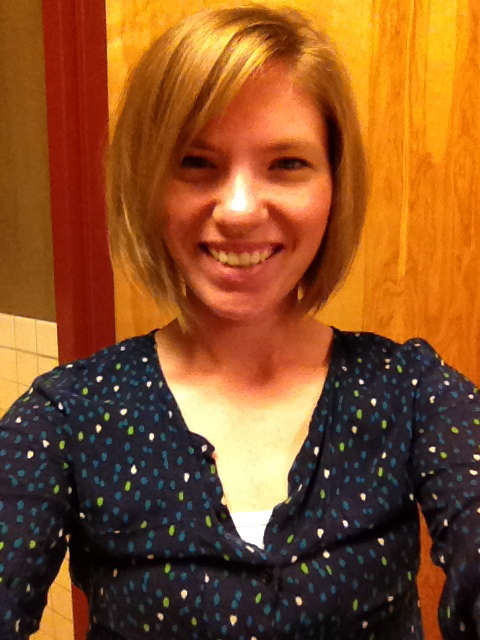 2 10″ ponytails are going to Locks of Love! Hope you found time to sweat today! For the love of my sanity, I had to switch up my workout today. I knew I needed to get a few miles in, but just was NOT feeling the regular routes I run. I did some dynamic stretches/moves and then a 2 mile warm-up at a 7:14 pace. Can I just say my admiration for Usain Bolt has skyrocketed. I mean, I loved him before…but man! I know he typically races the 100 & 200 m…but 20 seconds??? I’d be cocky too…just sayin’. 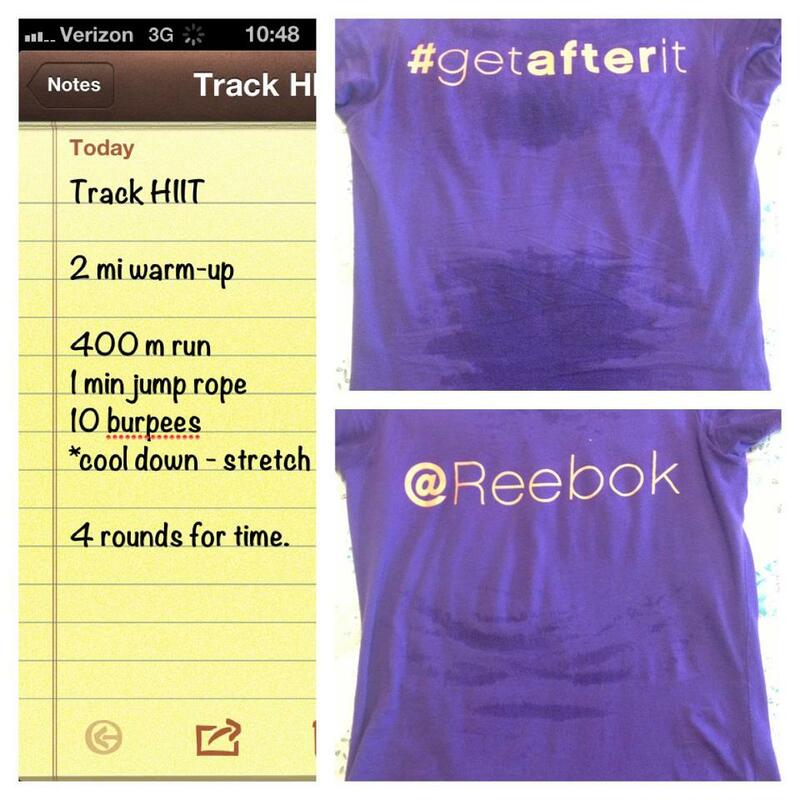 Get your own Reebok #getafterit tee here. If you can’t make it out to a track but still want a @ home HIIT to do..try this. 4 rounds for time: 10 – 35lbs overhead walking lunges, 1 minute jump rope, 10 burpees. Use a weight plate or a pair of dumbbells, whatever you have. Jump rope and some sort of interval timer. 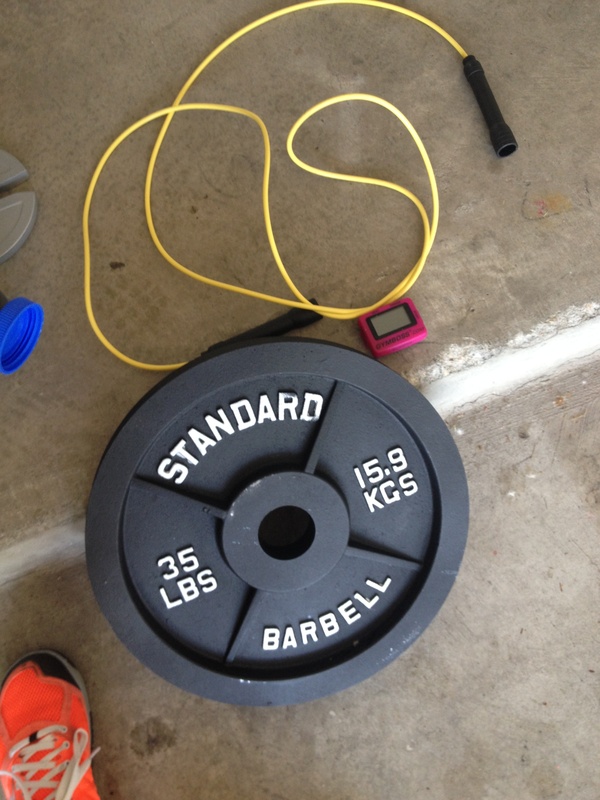 That weight plate has been one of the best fitness investments I’ve made this year! So far I’ve logged 30 miles this week in cardio…go me! 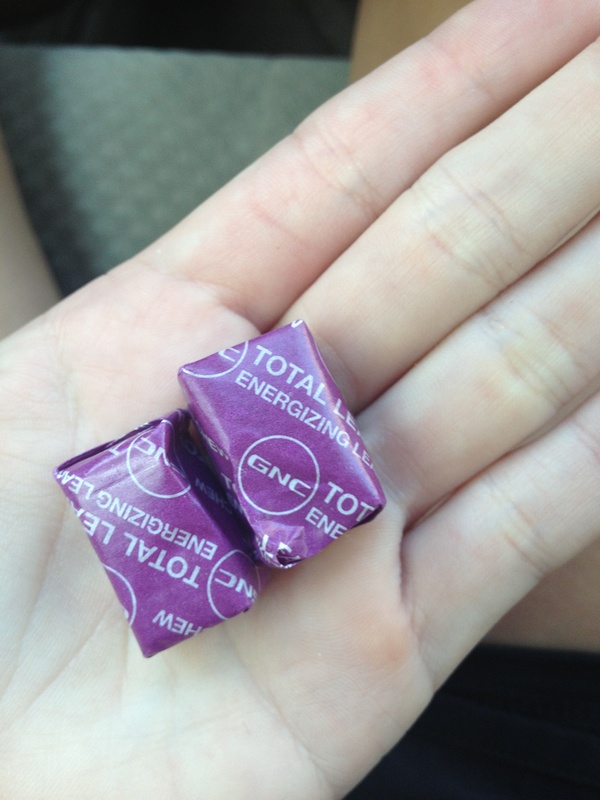 I LOVE GNC’s Total Lean energizing bites. And right now you can snag them for $10.99!